These days I find myself leaning more and more towards easy fuss-free wear. While I love pretty dresses and multiple layers as much as the next girl, in reality most days I'm lucky if I have time to brush my hair in the mornings. Is it just me or has the busy season hit most of the world? These boyfriend jeans have been in constant rotation lately and for good reason. They're comfortable, pairs well with almost everything in my closet and I love the way they contrast with a fabulous pair of shoes. Even my baby girl loves them, although for very different reasons. She loves to stick her arms into the holes and pat my knees, hence the extra large distressing. Being St. Patty's Day this past Sunday, I just wasn't in the mood for dressing up in a leprechaun green costumey outfit. 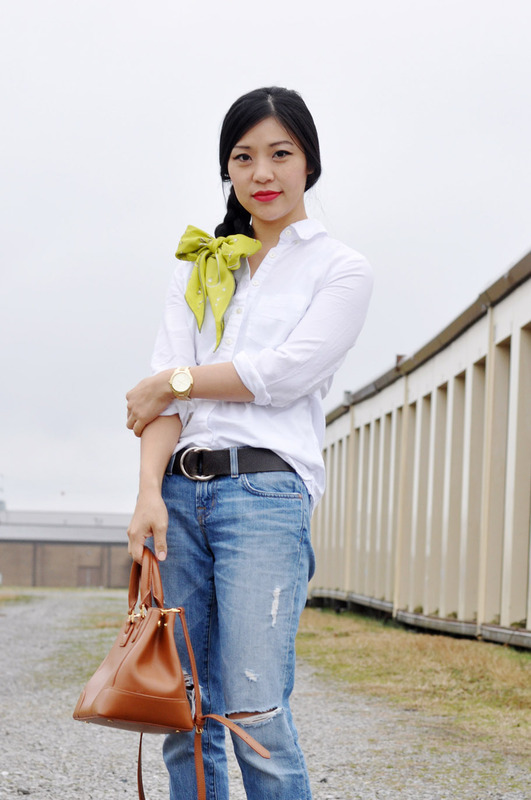 So instead I resorted to a simple white shirt and jeans ensemble accented by a brilliant green Hermes scarf tied into a pretty little bow. Sometimes a small dose of colour is just what you need. I have my days where I got back and forth, I want to be super fussy and fancy and then the next I just want jeans and a tank top! I love boyfriend jeans and heels! Great outfit! LOVE this look! The bow is super cute! I am sooooo trying this on my hair! Thanks for the inpsiration! I love this simple yet super chic outfit. LOVE the bow and those shoes are fab! Love, love those shoes! The bow is such a fun touch- I'd never think to wear one like this! from head to toe, i love the entire outfit. you look so beautiful love! xO! Love it! and the bow is a nice way to change just a regular hair do. I love this look! You look so chic in your distressed jeans, and your hair bow is the perfect touch! I'm a new follower! 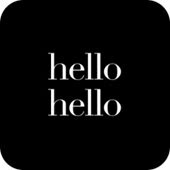 I'd love for you to stop by my blog! You would rock a gorgeous Hermes scarf instead of leprechaun green hahaha my boyfriend jeans have also been on a heavy rotation, LOVE this!!! Loving all of these. Super chic ! I am wearing my distressed jeans too today and mind you to my son's meeting at school... ha ha I am crazy mama. Where do I start?! Yes, busy season has definitely hit! How gorgeous are those heels!!!! Love at first sight! Perfect boyfriend jeans. Perfect touch of green. And that red lipstick looks amazing on you girl:)! Thanks for your kind words on my post today! You are so stunning, and I love the pop of color with the bow. I can never tie them as good as that! Lovely outfit! I like the bow on your hair, so pretty! This is so fabulous!! I love the bow. Perfect touch. first off your whole look is amazing & then the bow is the perfect way to add a little fun!!! so amazing & adorable! I love this whole outift! I've been on the hunt for some relaxed jeans and these are it! The bow is the perfect touch. OMG I love that your baby girl likes to put her hands through your jeans to pat your knees- that is the cutest thing ever!! hehe! I think this is my new favorite look of yours. I feel like I say that everything. But it's just so simple yet chic. Ahhhh you can just pull that off so well. When I attempt to look chic and simple, I end up looking like I've put no effort into anything. You look like 100000000000 dollars! I love your Jeans, you look so cute. I was looking at these J.Brands yesterday, love them. And you styled them amazingly, so pretty! What a cutie that your baby girl wants to pet you. And I have to say you must be one of the most stylish mums around! Love the bow accent and your shoes are fab!! If you get a sec, please check out my latest post. I would love to read your feedback. I really have no words for how much I love this look. It's so simple, yet chic. It's effortless. If I saw you walking down the street, you'd turn my head. 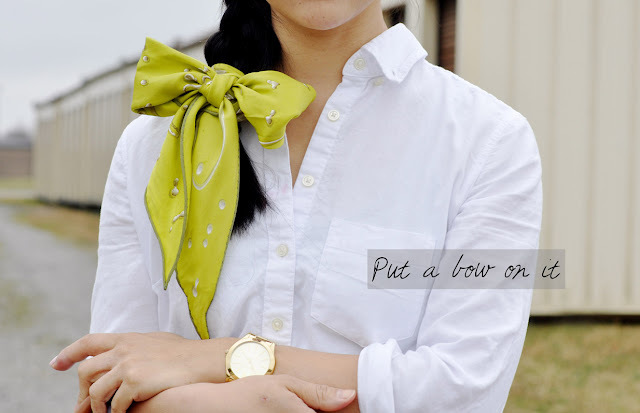 I LOVE how you took a simple outfit and elevated it with this vibrant bow. I'm totally going to copy this idea, btw :) Don't worry, I'll credit you lOl. Now, can you please give us a tutorial on how you made this bow from a scarf? Cuz I tried it today and it didn't work lOL. Love the bow on you, very cute! I need to get those sandals. Love it! I just love how you put together this outfit, Jenee. You already know I'm a huge fan of boyfriend jeans. Other than my skinny track pants, they're the only ones that get tons of wear these days. i love how delicate the bow is in contrast with the torn up denim! very cute! Hi! I love your blog, you are really stylish and this outfit is beautiful !!! If you want come into my blog, and tell me what you think about it! Maybe we should follow each other :-) what do you think? let me know I'll follow back you for sure ! Dexclusive is selling authentic brand watches, with some watches selling at a 75% discount.